Aahh. It’s nice to feel the cool fall air this time of year. I took a spin out past the moon and back to the Shire just in time for Fall festival to be into full festivities. I had an interesting dilemma at Fall festival this year. 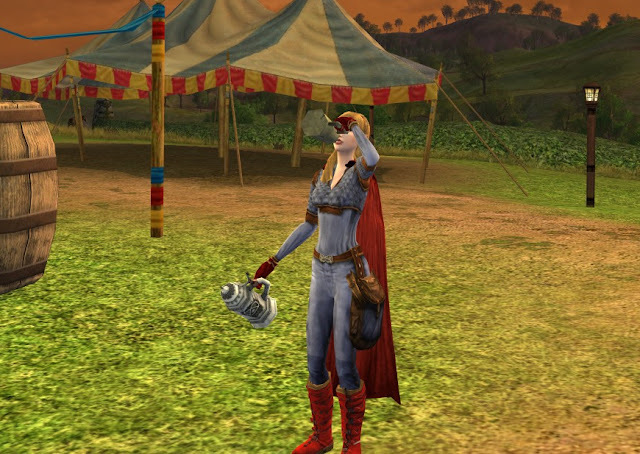 Since there were no new quests or adventures, I spent little time at the festival. The thing is that the lildanas and I hardly left the festival the past two years. We would try for the Painted Skeleton Horse every day, and fail every day. In celebrating so much last year, we amassed so many tokens that we didn’t even need to show up this year and could have taken home all the goodies. We tried and failed to get the horse for about a week this year, then shut it down and prepared for Rohan instead. In fact, a nice low-key festival was exactly what we needed. We did get to meet a few people at festival though and took home all the things. Here are some of the pictures of our time at festival. We had lots of pictures from Fall festival 2011 also @ (fun-fall-festival-friends!). We remembered the Haunted Burrow so well from last year, we could run through it with our eyes closed. 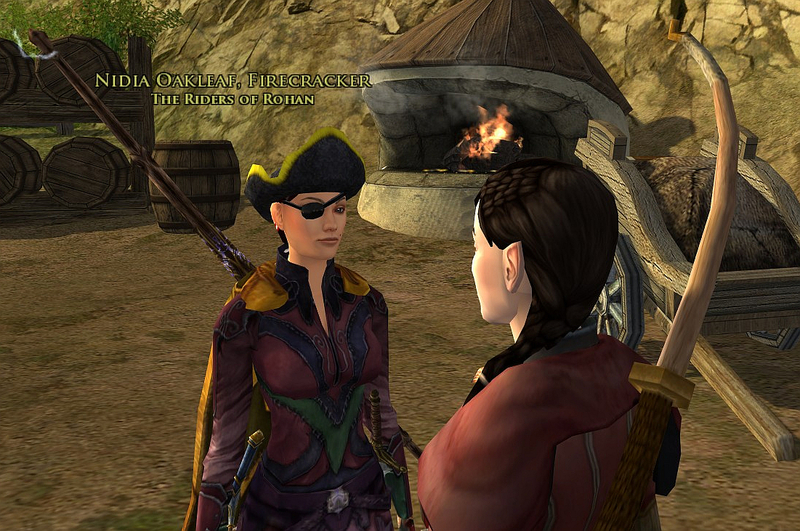 Danaszar gives a tour of the Haunted Burrow to new friend Shouriel. Nidia discusses fall activities with Danaszar and schemes to play a trick on me. Aaahhh! 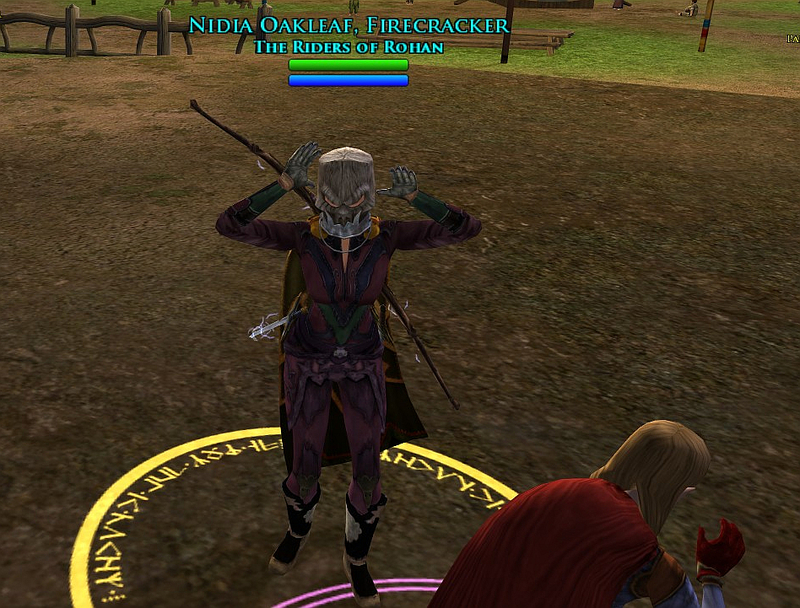 Bucket-headed Nidia gives me a good fright. 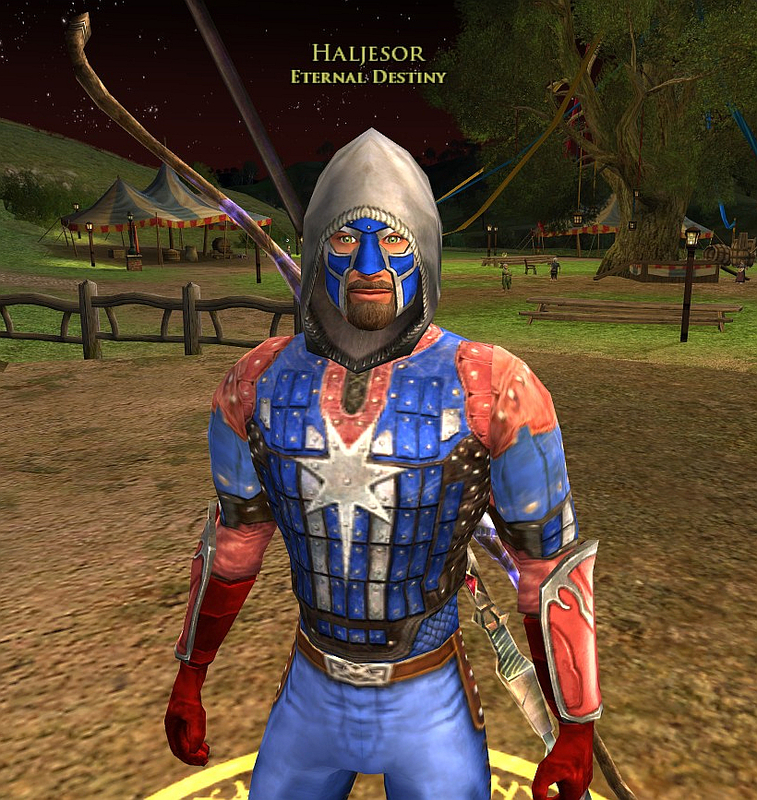 Haljesor dresses up for Halloween… or mebbe that is his regular attire. You can guess the inspiration for the outfit, yes? I change into my Batgirl outfit that I wore last year, and mount my Painted Skeleton Horse (this is one of the very few places I let the store trump more grind since I don’t like random fail... I did buy the Steed last year). 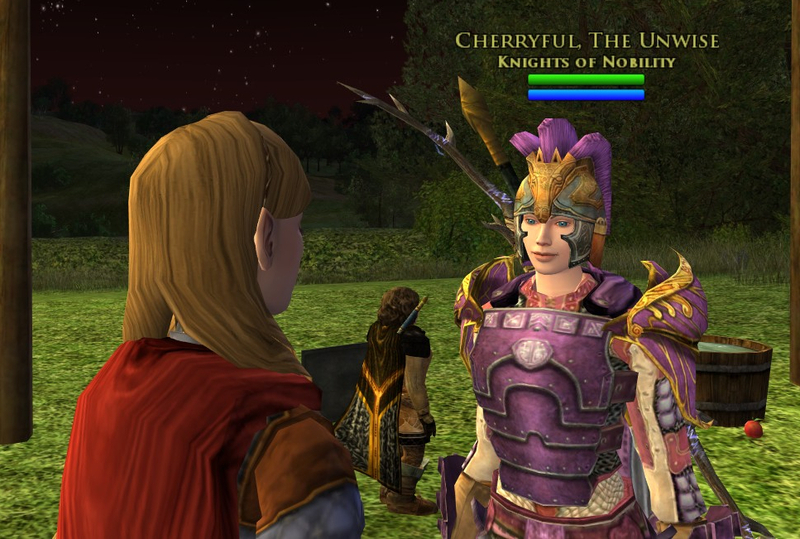 Cherryful shows that she is indeed the pinkest captain in the land. 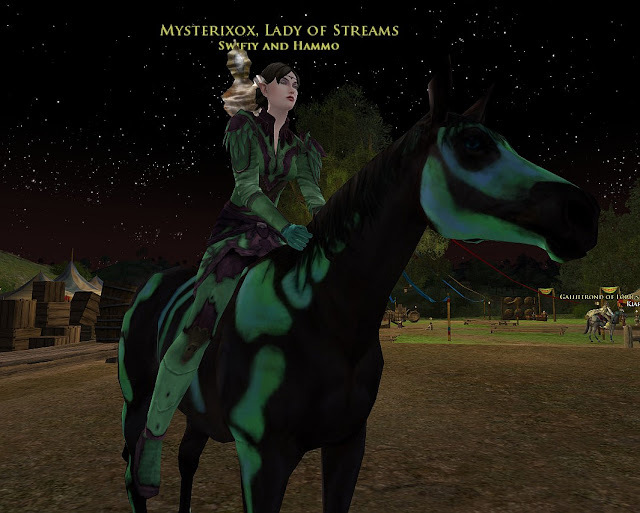 The famous Mysterixox (http://mysterixox.wordpress.com/) dresses to match the Green Painted Skeleton Horse. Asciel is ready to party. 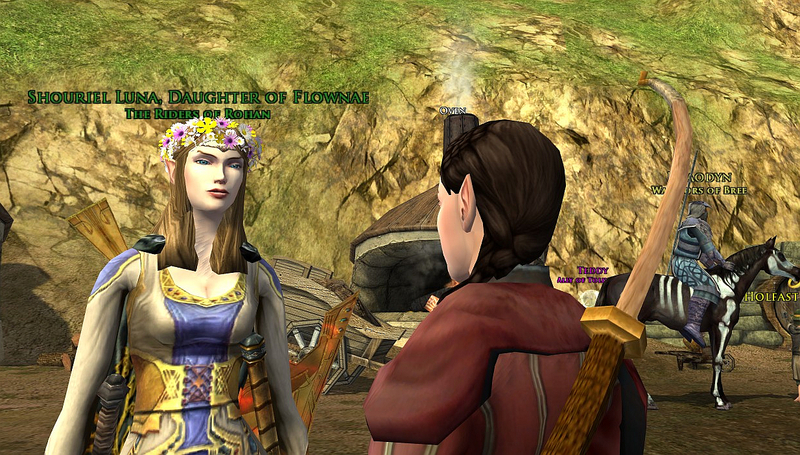 Fall festival at the Shire? Galtrev? It doesn’t matter; the party moves with her Hoopty-hoopty-hoop. 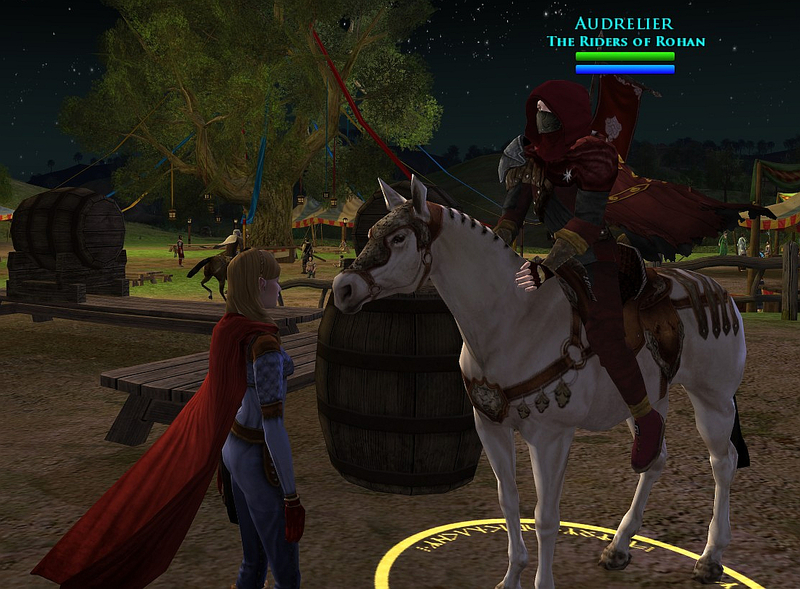 Audrelier rides the world-renown Eriador Horse, ready to scare hobbits at the Haunted Burrow. 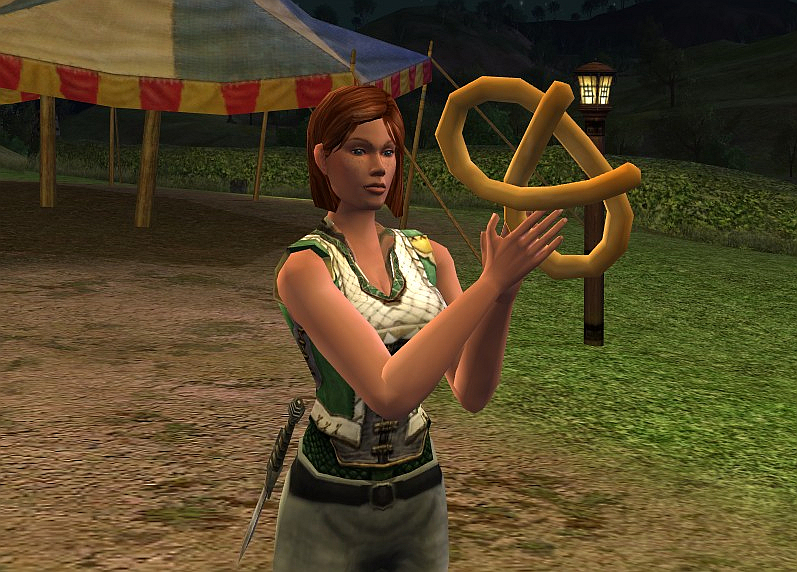 One new thing for me at this Fall festival was the addition of an Ale Association quest. Since this past Summer festival was my first time spent with them, this was my first view of the AA interacting with the Haunted Burrow. I spent some time playing tricks on the silly hobbits in the Burrow for the AA; then I went back to console them as part of the normal quest set. Here is one of the “ghosts” I sent after a scared hobbit. Danaszar wonders who the man in the portrait might be? Do you know who he is? He must be someone famous since he is a picture of a human in a hobbit house. 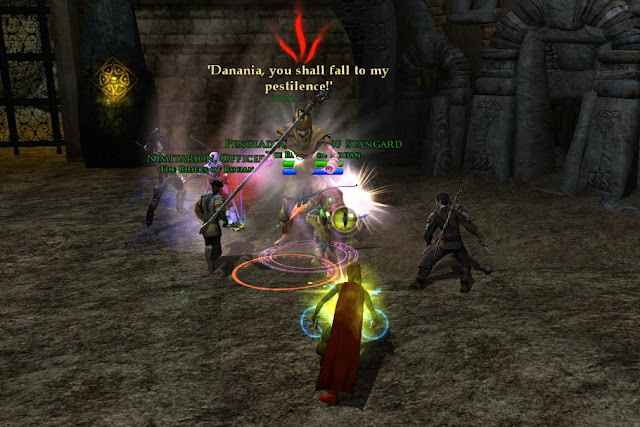 Danadalyn plays the “potion game”. 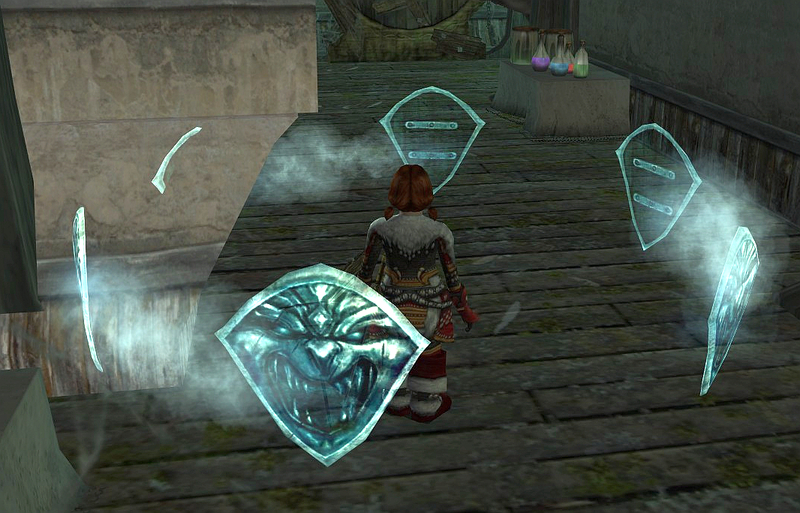 It is kinda funny; I never bothered to read the clues to tell me which potion to take to keep us safe. I read the clues now and they seem obvious and easy to solve, but in the moment, I just pick up a bottle and swig it… mebbe good, mebbe bad. The order of drinks is… White, Blue, Orange, Blue. I mentioned the barter prices for the goodies in a previous post. Here are some pictures of them. Here is the Beer Stein. Ok, the beer stein is in my right hand, and my other drink is in my left hand. Two fisted FTW. I explain Newton’s laws of motion as it applies to my Basket of Apples. The centripetal force due to the rotational rate at which I twirl my basket is greater than the force of gravity applied to the apples. Danaish practices as a hand model, showing off the lovely Fall Gourd she got at festival. The next item up is a giant Pretzel… because everyone needs one of those. 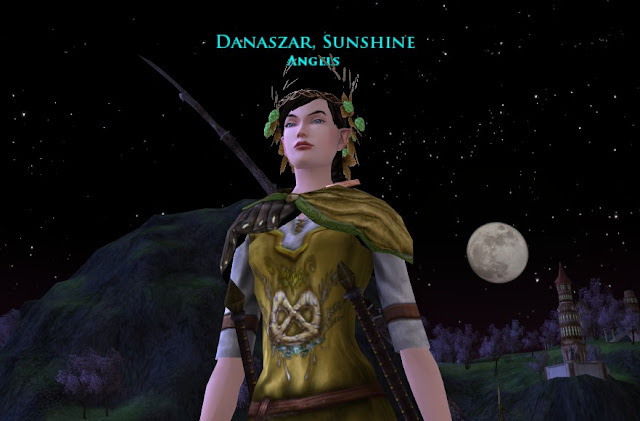 Danaszar takes some items back to the Home of Angels. Here is the Autumnal Apple Tree she planted out front. For a tree, it is one of my favorites (we also like the Yule-tree). If you watch the tree, you will see the leaves fall from the tree. We don't favor mounting dead animals on the wall. I am told that the ones from festival are made of faux fur and discarded feathers though. The crabans do look real. Here is a Craban perched on Stein. 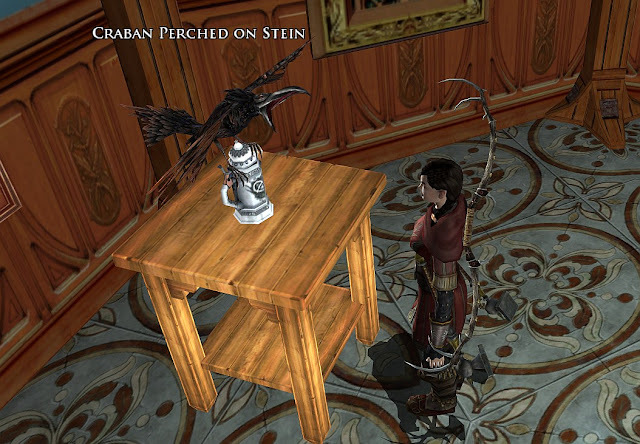 And, here is a Craban drinking from Stein. 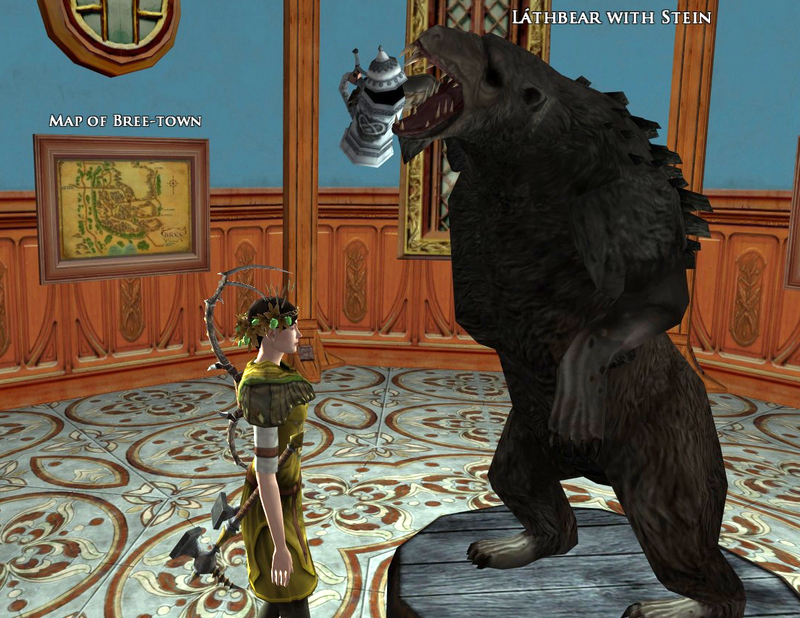 This one is a Lathbear with Stein. So strange; I don’t recall ever seeing a Lathbear before. 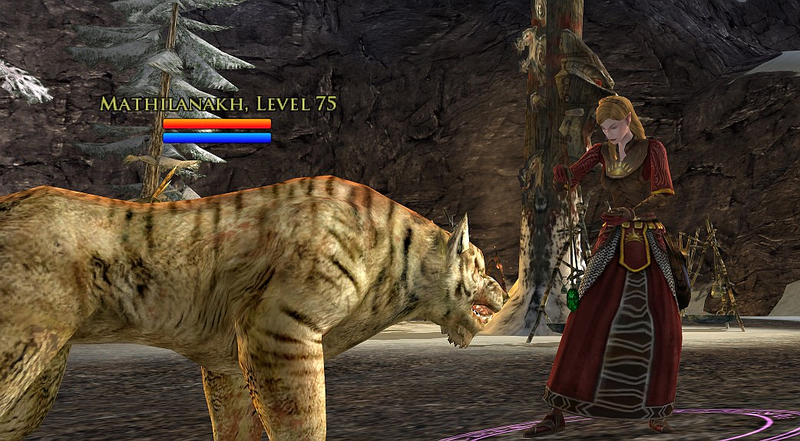 I had to google “Lathbear” and one of the answers I saw is that a Lathbear comes from the Rohan region. I foresee Lathbears in my future. It is kinda ugly… nothing like a Pooh bear (my favorite bear). 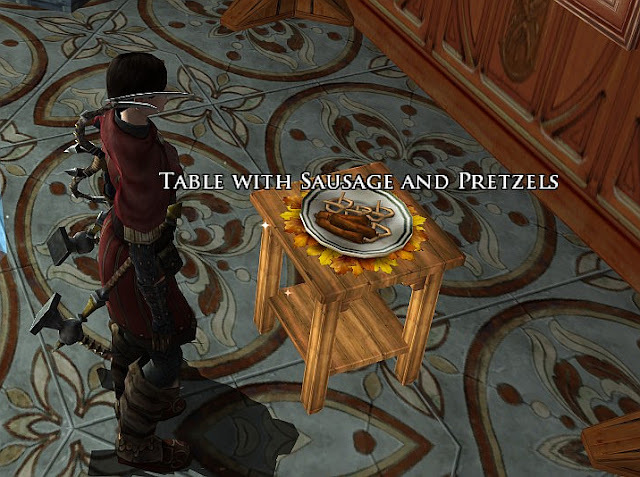 She managed to get a picture of the Table with Sausage and Pretzels before the hobbit quadruplets tested whether or not the food was wax or edible. I didn’t get the answer… wax or not, there was a reason I sent Danaszar to deliver the item versus letting Chief Move Coordinator DanaOnar handle the table. 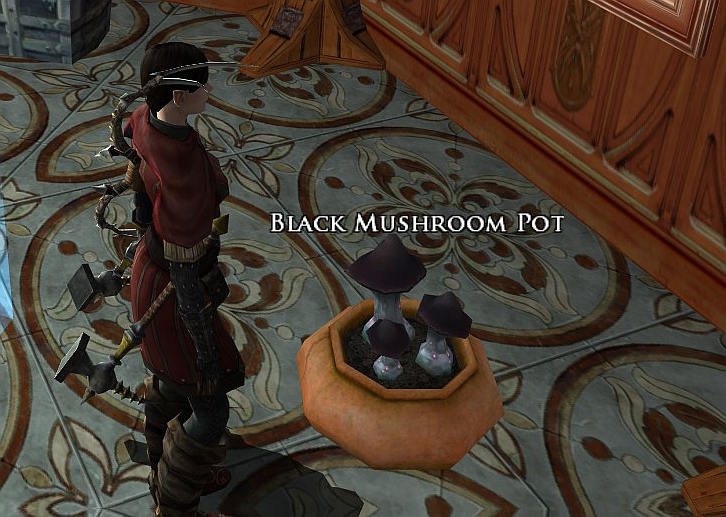 The farmers got Black Mushroom Pots from the festival. One of the quests from Summer festival is to “plant seed” there on the Hill; it is a quest only for farmers. 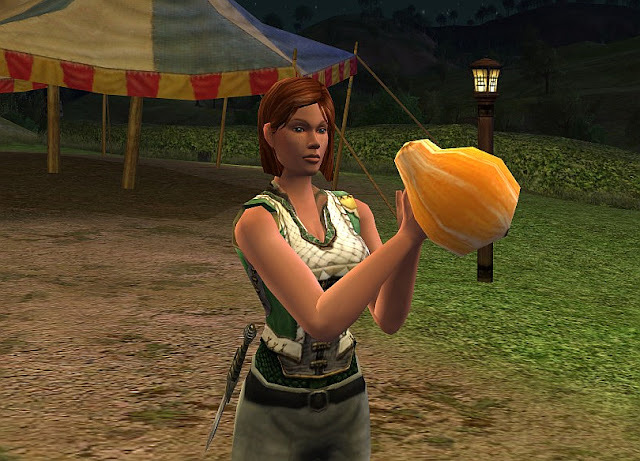 This item is the fruit of the effort, gathered in the Fall festival. In preparation of Rohan, the five lildana crafting team took the opportunity to advance from level 21 to level 25, which allowed them all to get new gear and more importantly… new Crafting Tools. With their new excellence, they got new clothes. 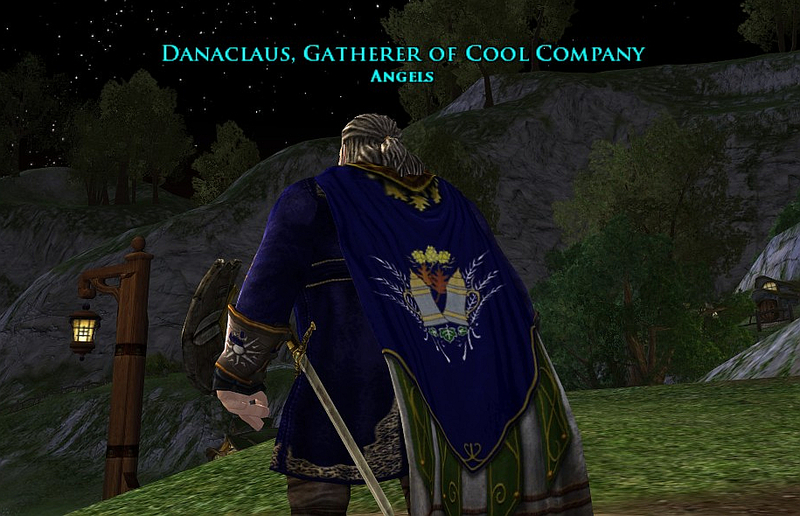 Danaclaus made a rare decision to ask for one of the clothing pieces. 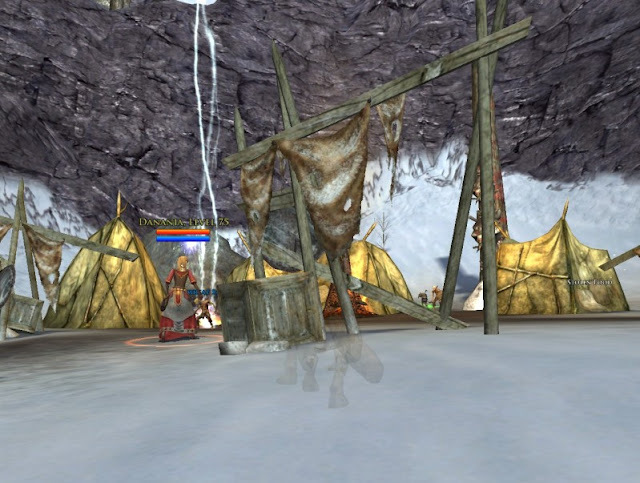 Here is the Harvest-Brew Cloak dyed Ered Luin blue. 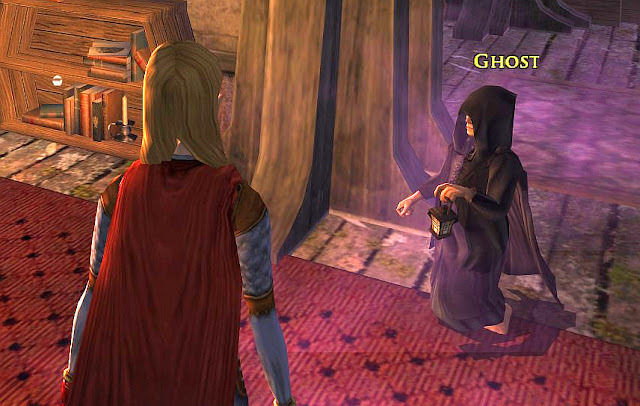 The hooded cloak is identical except… it has a hood. 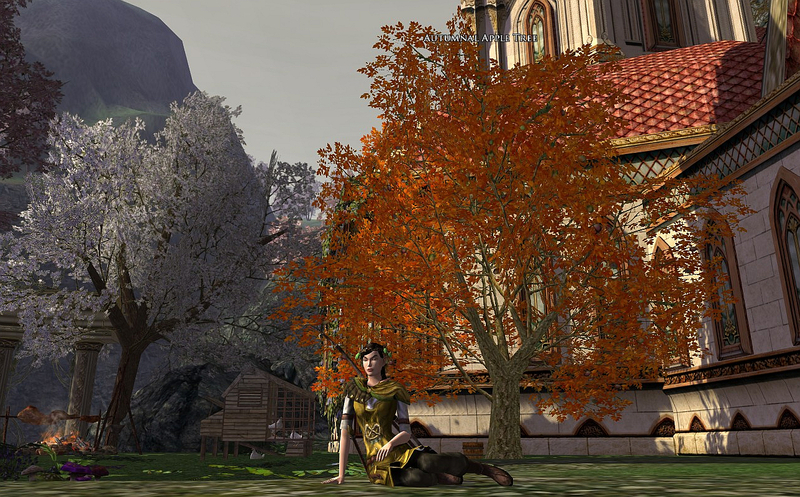 Danaszar took the Harvest-Brew short-sleeved Tunic & Trousers and dyed it gold. It is matched with the Harvest-Brew Circlet (I really like that one) and a shoulder piece called the Worn Ranger’s Wrap (probably from Isengard, also dyed gold, I can go look it up if someone really needs to know). 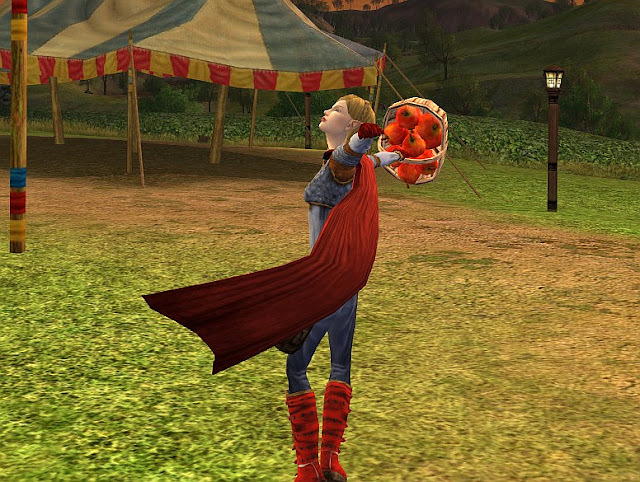 Danadelion took the Harvest-Brew Dress and dyed it red. The long lines of the gown really elongate her already long waist. 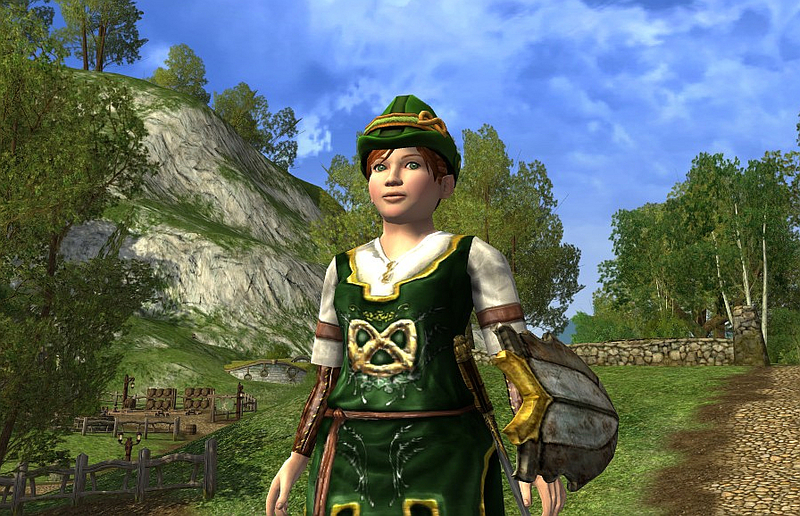 She matched it with an Elegant Festival Cap (which came from the Yule festival, dyed red). The elegance is a stark change to her normal wild-haired self. Danadalyn liked the Harvest-Brew long-sleeved Tunic & Trousers, dyed Dark Green, which seemed to match the Harvest-Brew Hat quite well. 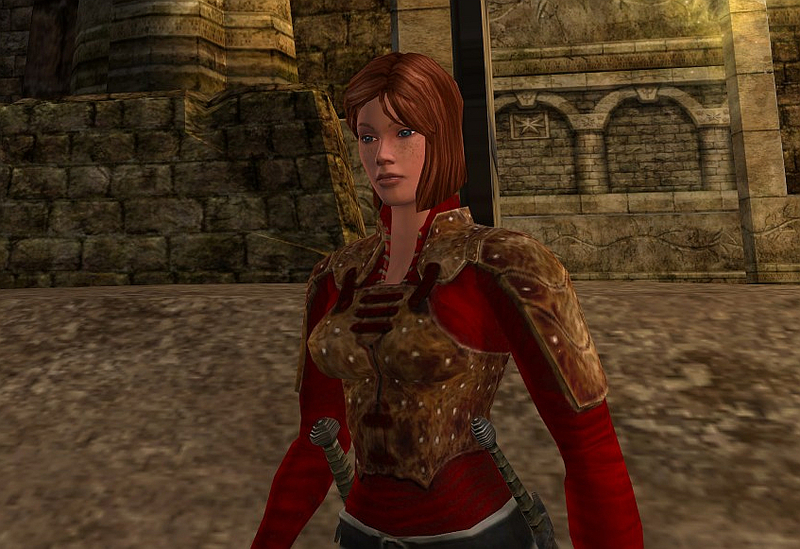 Danaish, not to be left out of the chance for new clothes, choose a new bold red top. It is a simple drop item, the Westernesse Jacket of Fate (probably from the Dunland area). And, we wait. Not much longer, and then it will be time to ride to Rohan. Here are a few of my final shots before mounting up. Here is a picture in which I join the ranks as a Malledhrim soldier. Sorry boys, olive green is not my color. I will just “blend in”. Can you tell which soldier I am? 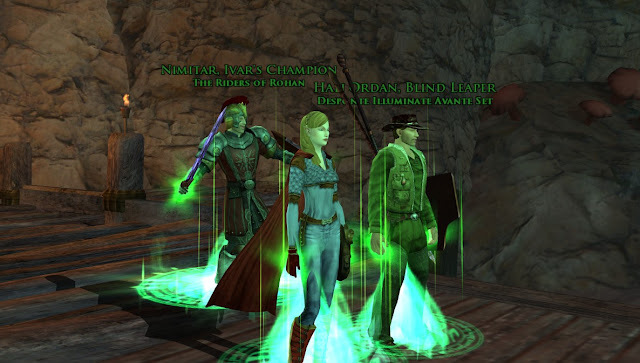 Nimitar, HalJordan and I join up to win in the Forsaken Inn. The Forsaken Inn is one of those “special” places where you are forced to have three specific-ish types of characters to be able to finish the challenge and certain deeds. 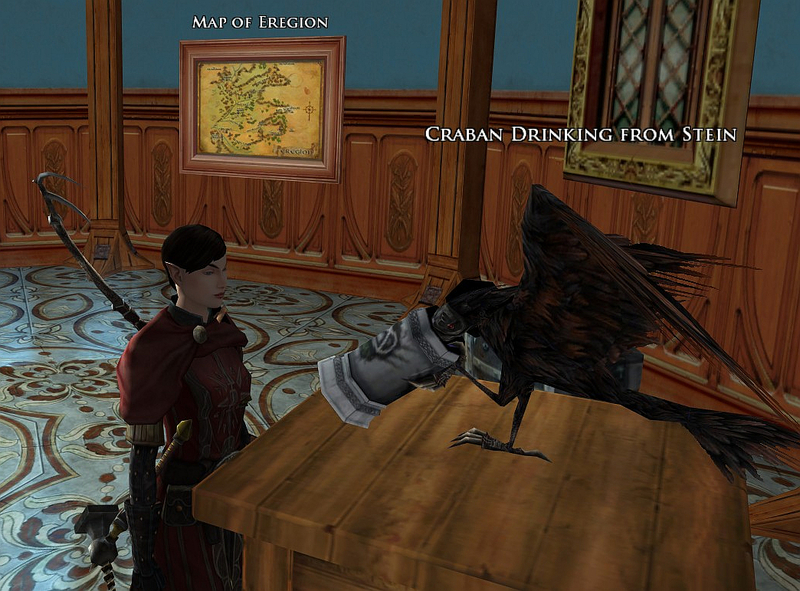 I went back in the Inn again and again and again by myself (etc) to try to solve all 83 riddles for the Riddle Deed. 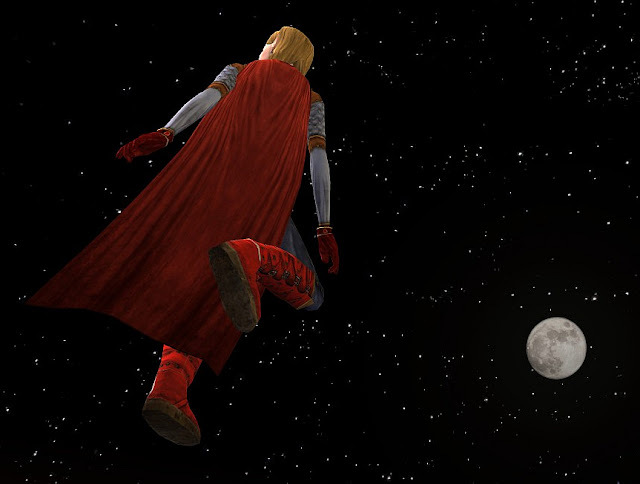 (inn-riddles) I am so close, but it will have to wait until another time. At 78 riddles done, I am sick of seeing the Inn. 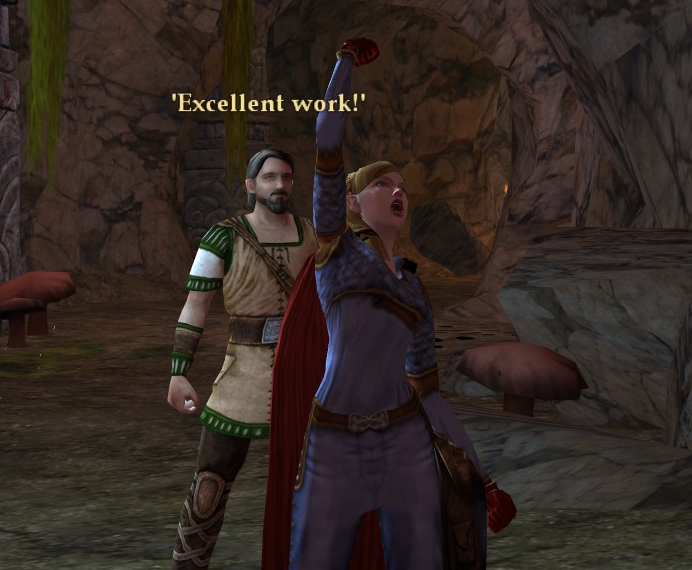 Umin mocks me with an “Excellent Work!” comment as I yell a challenge at the door after the several hundredth riddle. With the help of Nimitarion, Sailanarmo, Byrane, Pengladia, and Golechi, the Lost Temple Challenge was finally won. That is a crazy instance for a level 65 and it is tougher to win the challenge than most level 75s. Yay team! 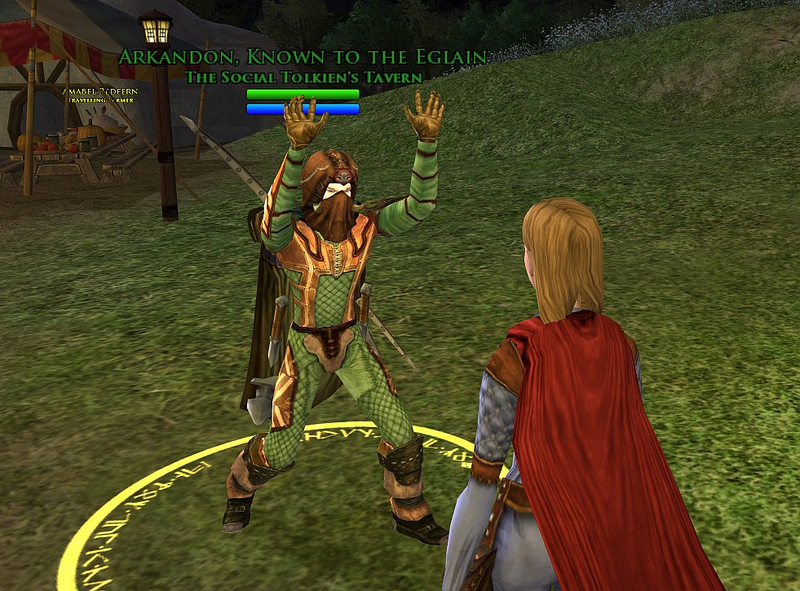 Ferndur the Virulent throws more disease my way, but our plan is sound and shall win the day! 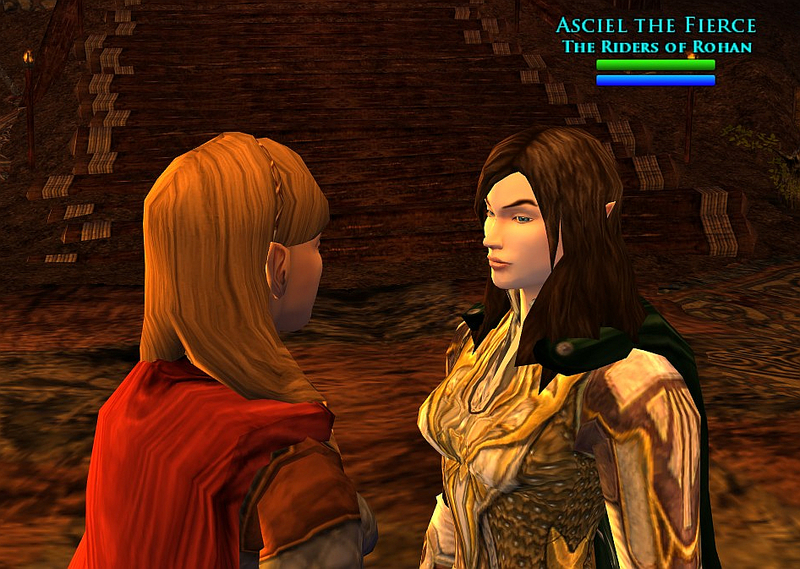 I was last seen in Lost Temple failing to beat the Challenge @ steeds-deeds-and-aegthil. Not often do I get “up-close-and-personal” with creeps in the Moors. 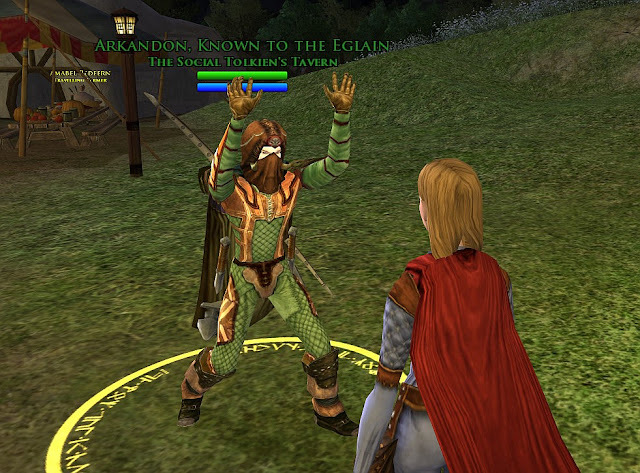 You may remember the surreal moment when I “met” Baglun and Ijust (ettenmoors-75-rk-armor-audacity). Here was another. 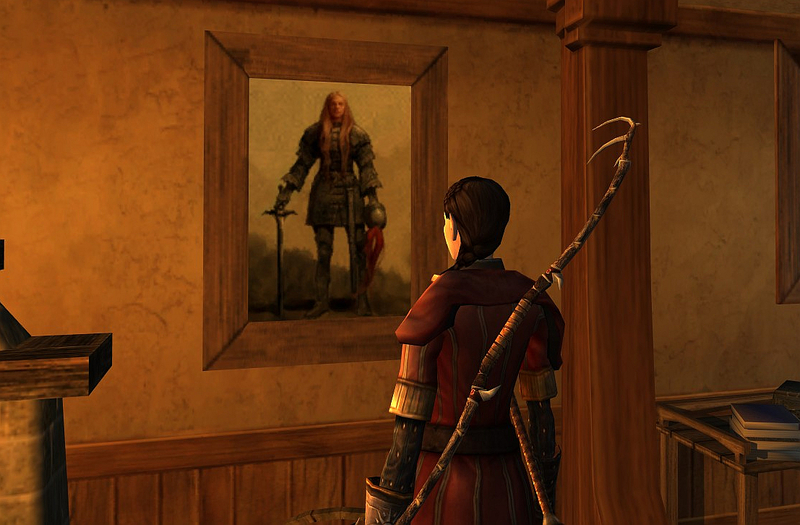 This next shot came from Mathilanakh, through the eyes of the stalker. I was minding my own business, thinning the goblin population in Grothum. A lightning bolt just split one wide open. Little do I realize, I am being watched… O.o The “hidden” image in the middle of the screen is my predator. What a surreal creepy image knowing that I am being hunted. lol! Time to fly. 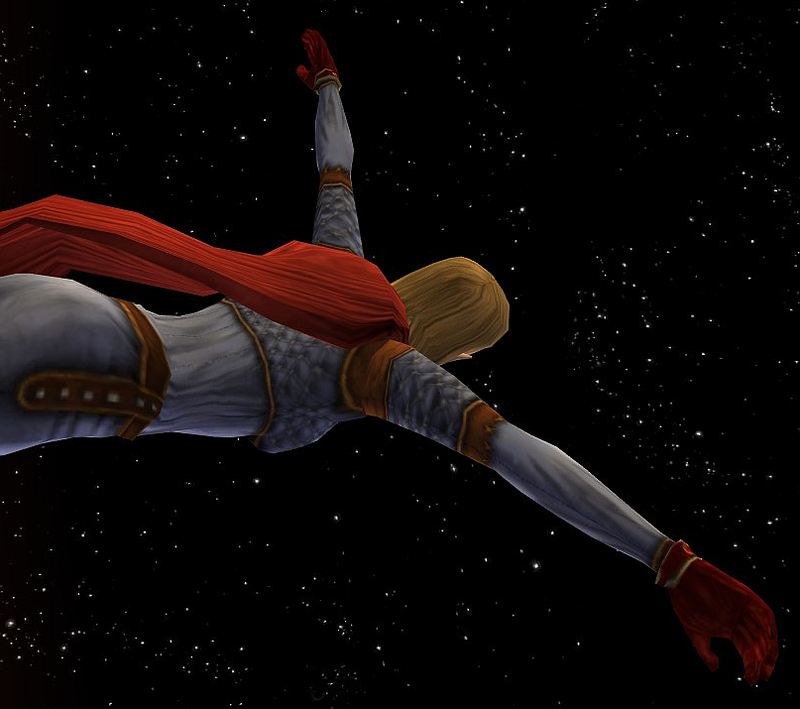 When next I write, I will be flying toward Rohan! Woohoo! Thanks Ravanel! 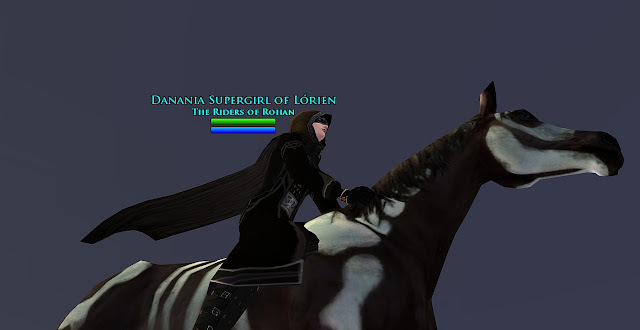 Of course you can ride! Lol! The falling leaves are very subtle... it's not like the tree is going bald. lol! It was bookended against the first one out past the moon.